A week after Rory McIlroy posted a video to get a point across, Tiger Woods appeared to do likewise in a bid to kill off rumours about his health. The 14-time major winner used Twitter to air a clip showing him swinging a club apparently without any sign of discomfort. “Progressing nicely,” was the assessment delivered by Woods in an accompanying caption, which was clearly his response to claims made about the 40-year-old at the weekend as he recovers from his third back surgery in 19 months. Steinberg also said in his statement that he would have an “accurate update” on the former world No 1’s rehabilitation at the “appropriate time”, with the posting of the video - it showed the player hitting a 9-iron in a golf simulator - less than 24 hours later a clear attempt to get a message out that Woods is much healthier than was being claimed. 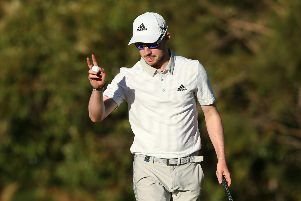 The unusual step by Woods, which was similar to how McIlroy responded to analyst Brandel Chamblee expressing fears about his gym regime, came after US Ryder Cup captain Davis Love had refused to write off Woods making his team for this year’s match as a player as opposed to having to settle for being a vice-captain at Hazeltine. Woods’ position in golf for all that he’s slumped down the world rankings was illustrated by the fact his video had been retweeted almost 10,000 times within three hours of it being posted. • See Tiger at work here.